All of our service providers have graduate level training in Psychology. 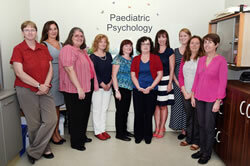 Our Psychologists and Psychological Associates are registered members of the College of Psychologists of Ontario. As a teaching hospital we train residents from the London Clinical Psychology Residency Consortium, and practicum students who are undertaking graduate studies in Psychology. Talk to your Children's Hospital physician or treatment team member. Some services may have a waiting list.